When the 8-bit microprocessor 8085 was released in the market in year 1977, engineers around the world have used it very extensively, so much that it became one of the main subject in electronics and related engineering under-graduate studies. Then came another very successful 8-bit microcontroller IC 8051 with peripherals and memory integrated inside the chip. It became so popular, even now engineers develop many hobby projects using 8051. It has so much overused, though latest 32-bit MCUs available in the market, many engineers still use 8051 for the simple reason of availability of lot of study material and reference design (in the form of free circuit-diagram and ready to execute code) available for developing 8051 based applications both offline through text books as well as online via plenty of tutorial websites. The freely available assembly program-code can be tweaked easily for any application. And also the 8051 chip and boards available in most of the electronics components shops on roadside at low price. But the electronics industry has moved over to 32-bit long time back mainly due to availability of energy efficient processor architecture called RISC from ARM and MIPS. Even the leading microcontroller vendors have developed energy efficient 32 bit processor architecture internally. The embedded systems developed using 32 bit microcontrollers have that simple advantage of 8-bits vs 32-bits, and so performance improvement is not 4x but is much more. The engineers who have not used 32-bit environment find it difficult to get jobs in embedded systems applications because 32-bit embedded programming has some learning curve for 8-bit programmers. If not difficult it's going to take some time. Companies prefer design engineers who already have hands-on experience with 32-bit. If you ask about the software for code-writing, the free IDE is available from Coocox, Keil and even IAR has a free/trial version with some limited features. 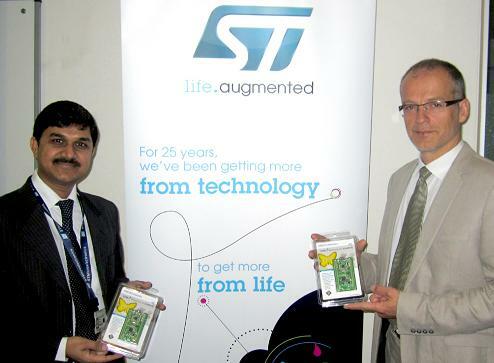 ST is providing the complete eco for low-cost open-source 32 bit embedded board development in India right now. Finally its time to say goodbye to 8-bit MCUs. 32-bit MCU outweigh 8-bit microcontroller by offering all the advantages. The STM32F030 comes with a full set of performing peripherals, such as fast 12-bit ADC, advanced and flexible timers, calendar RTC and communication peripherals such as the I²C, USART and SPI. The program code is easily compatible with higher version of STM32 family and some of the devices are pin compatible.